For individuals with type 1 diabetes (such as myself), frequent monitoring of blood glucose is a necessity of life. A blood glucose level that climbs too high or falls too low can lead to dangerous health situations, and keeping relentless track of the level is essential to managing diabetes effectively. To help provide this important information, many individuals wear a Continuous Glucose Monitoring (CGM) device which includes a hair’s-width under-skin sensor and a small transmitter pack. The CGM measures blood glucose in real-time and sends that data wirelessly to a nearby display device. While CGMs are quite helpful, many users find the fact the devices can only transmit to a display within wireless range to be limiting. This has especially been an issue for children with type 1 diabetes who couldn’t safely participate in activities where they would need to be apart from their parents or other trained caregivers. Seeking to improve the functionality of these devices — and to make it possible to access CGM data over the internet from any computer or smart device using cloud technology — a group of these parents (who happened to also be developers) started working on such a solution. The result of these efforts became Nightscout (CGM in the Cloud). With Nightscout, the display device in the CGM system is connected to a smartphone, which, thanks to some open source code, can access the needed data and then send it to a cloud database where it can be accessed from any online location. The result is parents can monitor their child’s blood glucose levels from afar and know they are safe (and make a phone call or come to them if action is needed). 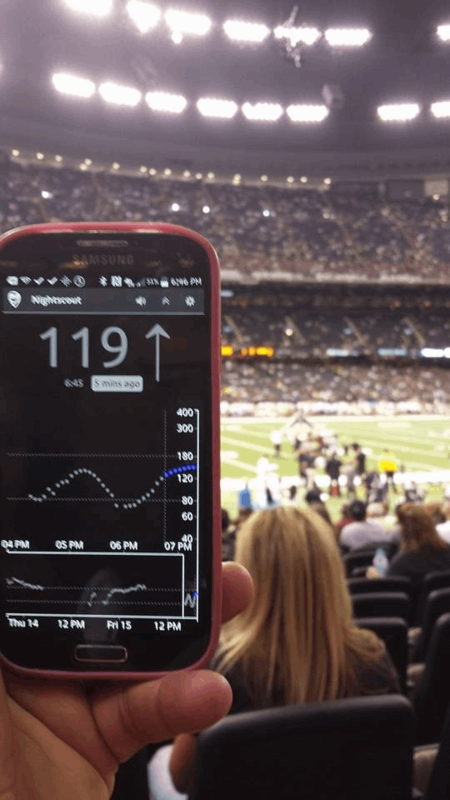 The Nightscout project's strength it is a do-it-yourself, open source project supported by a community of parents and individuals connected to type 1 diabetes and is openly available to anyone who would like to use it. This means most users are decidedly not professional software developers or DBAs with expertise in these systems, but are just parents using Nightscout for the sake of their own children. Because of this, it was important to make Nightscout as simple to implement and maintain as possible, so non-technically savvy parents can realize the benefits. And, due to the cost burdens associated with treatment of type 1 diabetes, it was important any technology leveraged for the project was affordable and fit the needs of an open source project. On the technical side, Nightscout leverages MongoDB’s open source database program. Then, in order to facilitate the ability of any parent to create and manage a MongoDB database, we chose to utilize mLab as an easy-to-use cloud Database-as-a-Service platform. mLab offers a free Sandbox plan for databases up to 500 MB (and keeps things affordable beyond that). The user interface and cloud automation makes creating a new database as simple as online retail shopping. Many of these database deployments are on Microsoft Azure, which offers a free trial and a Platform-as-a-Service product to make it run and to maintain the Nightscout project’s code. Typically, a new Nightscout-using parent will begin by utilizing the project’s step-by-step directions. This begins with setting up accounts with mLab and Azure and the Nightscout setup process has been streamlined to a degree that getting these accounts up is about two-thirds of the total initial work. With an mLab database ready to go, the parent goes into GitHub and connects into Azure, and their account is updated and Nightscout is deployed. At the end of setup, the user has a live URL for a site that receives and displays data from the CGM device. That online site allows parents of diabetic children to then access that data from any convenient computer or smart device. Beyond this, the Nightscout community has produced guides, worksheets, and other helpful resources to assist anyone who needs support in their new role as a DIY technology hacker. There’s also a community Facebook group where experienced users are always ready to answer questions. But overall, parents are able to implement the service they need without developing a sophisticated understanding of the tools and code they are making use of. Nightscout now has thousands of families participating, and the stories parents involved with the project tell are truly heartwarming. With parents able to keep an eye on CGM data at a distance, kids with type 1 diabetes are having their first sleepovers with friends. They’re playing sports, having long visits with grandparents, and attending school without CGM concerns getting in the way. By democratizing cloud and database technologies, children are enjoying more freedom and parents are enjoying a newfound peace of mind from being able to check CGM data through the cloud and know their kids are doing well. Ben West is co-founder of Nightscout (GCM in the Cloud), an open source, DIY project that allows real-time access to CGM data via personal website, smartwatch viewers, or apps and widgets available for smartphones.